German rocket enthusiast and fraudster. 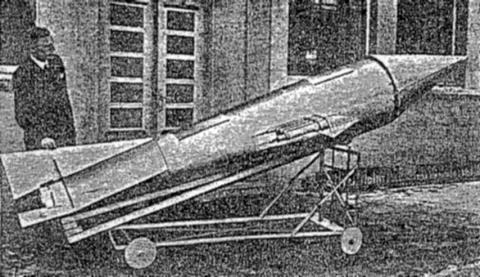 In 1931-1934 toured Germany and UK with bogus 'operational' and postal rockets. Caused a death in a rocket explosion in 1964, resulting in ban of private rocketry in Germany. Born: 1900. Died: 1985-01-01. Birth Place: Hasselfelde, Sachsen-Anhalt. Gerhard Zucker was born in 1900 in Hasselfelde, in the Harz Mountains of Germany (coincidentally the town is only about 17 km from Nordhausen, where subterranean slave laborers built V-2's 44 years later). 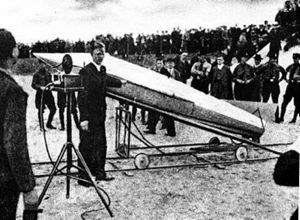 He began as a maker of butter and Harz cheeses but first came to public notice in 1931 when he began flying fireworks-type powder rockets on 'rocket post' flights in various villages in the region. In 1933 Zucker began touring Germany with his amazing 'operational rocket'. The recoverable cruise missile was 5 m long, had a thrust of 360 kg and a takeoff mass of 200 kg. It was supposedly capable of cruising out 400 km from its launch point at an altitude of 1000 m and a speed of 1000 m/s. It could then return after having delivered a bomb payload or having taken reconnaissance photographs. In actuality the missile was only an enormous hull equipped with eight powder rockets. Zucker showed up in Cuxhaven on the German North Sea coast in the winter of 1933, ready for a long-range demonstration. After being stuck in a ditch while being taken out to the field for a February launch attempt, the great day finally came in April 1933. A huge crowd of local folk and officials gathered to witness the event. After staggering 15 m into the air, the torpedo came crashing down. This did not prevent Zucker from touring other towns in Germany, attempting further rocket tests, and selling non-official 'rocket' postal covers supposedly carried by his rockets. In the winter of 1933/1934 he was said to have demonstrated his rocket to Nazi government officials. They later claimed that they wanted him to develop the rocket to carry bombs, which he claimed that he refused to do. He next appeared in England, where in May, 1934 he exhibited his rocket 'postal covers' at the London Air Post Exhibition. There he claimed that he wanted to interest the British government in his rocket. Photographer Robert Hartman agreed to be his publicist, and postage stamp dealer C H Dombrowski backed production of Zucker rockets in Britain. The group planned to make thousands of pounds on the sale of Zucker's 'rocket post'. Zucker immediately began to claim there were many problems in replicating his 'successful' German flights. The Nazis had banned the export of proper rocket fuel. No one in England knew the secret of packing the powder cartridges. The runners of the launch ramp needed a special secret German lubricant. And so on. Mrs Dombrowski supposedly made an attempt to smuggle the secret rocket fuel out of Germany in her hat box, to know avail. It was said that Gestapo agents were watching every move of the trio. Using what he said was brilliant improvisation, Zucker built a (smaller) rocket using substitute materials (including butter for lubricants). 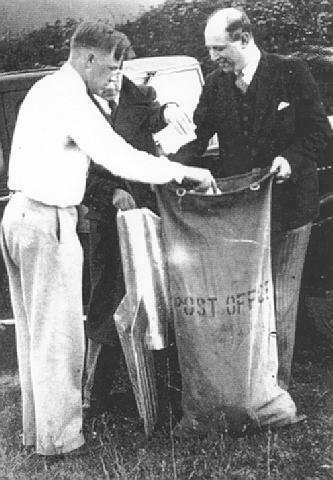 On the early morning of June 6,1934 Zucker, Dombrowski, a reporter and a photographer from the London Daily Express, a philatelic magazine editor, and Hartman met on a hilltop on Sussex Downs. After a first successful test launch without payload, two launches were made with postal covers. The observers guessed the rockets went as high as 400 to 800 m. Banner headlines the next day announced 'The First British Rocket Mail' and carried Zucker's claim that soon he would inaugurate regular one minute rocket post service between Dover and Calais. The next step was to impress the Royal Mail with the potential or rocket post. Zucker announced a demonstration firing of his rocket over 1600 m of water between the town of Harris and the Isle of Scarp. This smaller model airframe was 1.07 m long with a diameter of 18 cm. The solid fuel cartridge (a copper shell with asbestos lining) fixed inside was 55 cm long and 6 cm in diameter. The rest of the fuselage was packed with 1,200 pre-sold 'highly profitable mail covers'. 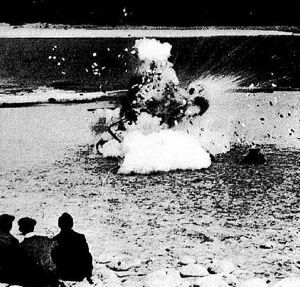 Government officials watched on 31 July 1934 as the rocket exploded, blowing the burning payload all over the beach. Zucker diagnosed the cause as incorrect packing of the powder cartridges. The singed envelopes that were recovered only seemed to have a greater cache with collectors. The British found Zucker to be a 'threat to the income of the post office and the security of the country'. He was deported to Germany, where he was immediately arrested by the Germans on suspicion of espionage or collaboration with Britain. He managed to avoid arrest and commitment to an asylum but was forbidden to make further rocket experiments. During World War II he served in the Luftwaffe, being invalided out in 1944. He returned to his home in Hasselfelde, which ended up being just within the Russian zone of occupation. He eventually moved a few kilometers onto the West German side of the border, became a furniture dealer, and resumed rocket experiments. A student was killed in Braunlage in 1964 during one such experiment. This led to a ban on non-military rocket launches in West Germany and the closure of the civilian spaceport in Cuxhaven. Nevertheless by the 1970's Zucker had resumed launching fraudulent 'rocket postal covers'. Having done a great deal to set back scientific rocketry in Germany, Zucker died at home in his bed in 1985. His widow and children returned to Hasselfelde after the fall of the Berlin Wall. Country: Germany. Bibliography: 556, 559, 560, 6263. 1934 June 6 - . Launch Vehicle: Zucker Rocket. Zucker mail rocket launch at Sussex Downs - . Nation: UK. Related Persons: Zucker. Apogee: 0.60 km (0.37 mi). Zucker, his backer, and selected press representatives met on a hilltop on Sussex Downs. After a first successful test launch without payload, two launches were made with postal covers. 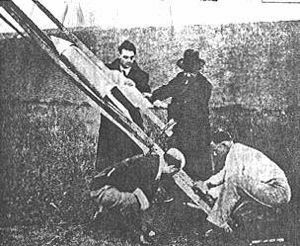 The observers guessed the rockets went as high as 400 to 800 m. Banner headlines the next day announced 'The First British Rocket Mail' and carried Zucker's claim that soon he would inaugrate regular one minute rocket post service between Dover and Calais. 1934 July 31 - . Launch Vehicle: Zucker Rocket. Zucker mail rocket explosion at Harris - . Nation: UK. Related Persons: Zucker. Apogee: 0 km (0 mi). Zucker announced a demonstration firing of his rocket over 1600 m of water between the town of Harris and the Isle of Scarp. Government officials watched as the rocket exploded, blowing the burning payload of postal covers all over the beach. The British found Zucker to be a 'threat to the income of the post office and the security of the country'. He was deported to Germany, where he was immediately arrested by the Germans on suspicion of espionage or collaboration with Britain. 1985 January 1 - . Death of Gerhard Zucker. - . Related Persons: Zucker. German rocket enthusiast and fraudster. 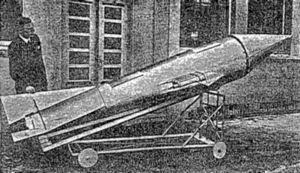 In 1931-1934 toured Germany and UK with bogus 'operational' and postal rockets. Caused a death in a rocket explosion in 1964, resulting in ban of private rocketry in Germany..